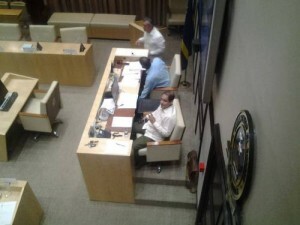 WILLEMSTAD – In an urgent parliamentary meeting called by the new majority consisting of MFK, Korsou di Nos Tur, Pueblo Soberano, Movementu Progresivo and Independent MP Edward Braam, adopted seven motions of no confidence against the Prime Minister of Curaçao Hensley Koeiman and the other Ministers in his cabinet except the two Ministers for Pueblo Soberano, Jaime Cordoba and Ruthmila Larmonie-Cecilia. This means, according to the new majority, that the 7 other Ministers must resign immediately since they do not have the support of a majority in Parliament. The new majority opts to install an interim government until the upcoming elections of April 28.